There is a myriad of information on the web about this problem, but nowhere I have found so far shows how to fix it with all of the above installed on your Windows 10 system. With this edit, All of my apps appear to be showing Sync, Error, and Syncing icons without issue. I have the exact same problem, but what is the edit? To add “x” or “2” before the names of the registry entries? Thanks! I add an x before DropboxExt3, 4 6 and 8. (and remove space). Also for Offline Files. When I try and put a space in front of OneDrive1 /2/3/4/5 it comes up with an error message. 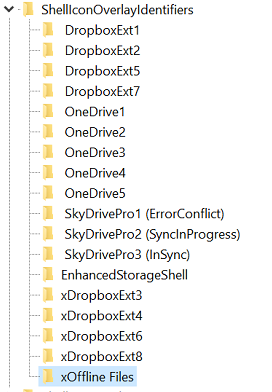 “The Registry Editor cannot rename OneDrive1. Error while renaming the key.” I think I need to right click and give System & Administration the permission to read/write. When I try that it says “Unable to save permission changes. Access is denied.” What should I try now? you need just allow from firewall in “Allow an app or feature through windows firewall ” no more . tried to edit , I tried to start redit as admnistrador , tried to restart the computer in safe mode and tried to edit the rededit started as administrator in seguranaça mode environment. Always gives the same error mentioned by Peter (“The Registry Editor cannot rename OneDrive1. Error while renaming the key.”). Could you please give us the steps to do it??? But outside that, I cannot help, sorry. Could you tell me what the significance is of having a symbol appear to the right of the white tick in the green circle. I have just noticed it against one of the folders (including all sub folders and files). My other One drive folders just have the normal white tick in a green circle with no accompanying symbol. Best way I can describe the symbol is that it looks like an old fashioned TV – a square on two slanted legs! I found there were more than 16 slots used so I removed the unused Dropbox application and restarted explorer.exe and viola the icons are back. Thank you so much for this fix!